Is Carmelo the next to leave Denver? 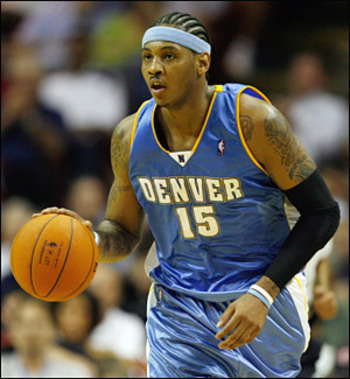 Most NBA experts think it is not a matter of if Anthony will leave Denver, but when. Much of this is of course based on speculation, and as such there is no consistent theme to the stories. SI.com is reporting that Anthony would be willing to sign the extension if he is traded to the Knicks, Nets or Rockets. An ESPN.com story by Ric Bucher talked about toasts at Anthony’s wedding by Chris Paul and Amare Stoudemire, talking openly about joining forces in New York with the Knicks. The thinking goes that Anthony is an east coast boy, born in Baltimore and a proud Syracuse alumnus. There are lots of quotes from anonymous sources, usually ones who are “close to the situation”. There is also the practical evidence that Anthony’s south Denver house is on the market, to the tune of a cool $9.5 million. There is also a potential lockout looming in 2011, meaning the free agent market next summer may not be as desirable for Anthony is it was this summer for LeBron and his buddies. This makes the situation tough to predict and dissect because ultimately we don’t know what Anthony is thinking. As it stands now here are the possible ending scenarios for this saga, in no order whatsoever. – He signs the extension and stays with the Nuggets: For all we know, Anthony could be taking his time to make sure staying in Denver is the right decision for him. House on the market aside, Anthony could be concerned about the potential lockout and may ultimately decide that the guaranteed money that is on the table for him now is the way to go, even it means he stays in Denver. It is possible that whatever contract Anthony garners as a free agent could be significantly less than his current offer from the Nuggets. There is also the possibility that Anthony is waiting to see who the Nuggets hire as their new general manager (Mark Warkentein and Rex Chapman were fired from the front office last month). If that’s the case, the possibility exists that Anthony could be talked into staying. – He says he will not sign the extension and the Nuggets trade him: The Nuggets could decide to cut their losses and deal Anthony to avoid losing him as a free agent. They would explore the best deal among the teams that Anthony wants to be dealt to. It is possible the Nuggets do this to cut their losses and would also be a signal that they would be starting the rebuilding process. It is more than likely that the Nuggets would get little more than cap relief in return for their superstar for there is a proven track record of teams not getting equal value for their stars in trade in all sports. – The Nuggets could decline his trade request and make him play out the final year of his contract: This would obviously be a very risky move, not only because they might then get nothing for Anthony if he leaves after the season, but they could also be dealing with an unhappy superstar. In a funny way, the looming threat of a lockout could play into Denver’s favor in this scenario because it might ultimately scare Anthony into signing the extension if he feels the market next summer won’t be player friendly. Then again, it is also possible that this would allow Anthony to bide his time and simply sign with whatever team he wants to play for next July. I am still hopeful that Anthony will sign the extension and stay in Denver, but the realistic side of me says that is probably unlikely. After all, even more money didn’t convince LeBron to stay in Cleveland. I think Anthony feels that he is not viewed in the same class as LeBron, Wade, Kobe, etc. My response to that is that Anthony has not won the way the others have. He has only gotten the Nuggets out of the first round of the playoffs once in seven seasons. If he wants to leave because he feels the Nuggets haven’t been loyal to him, that’s his problem because the Nuggets have done more than enough to show him that he is their franchise player. If he wants to leave because he feels like another place is his best chance to win a championship, well, it’s not like the Nuggets haven’t tried. Their payroll is well above the luxury tax because they’ve tried to get Anthony help. Ultimately, whether it’s in Denver or somewhere else, Anthony will need to prove he is a winner. Where will it be? I hope it’s Denver but I don’t have any more of an idea than anyone who isn’t Anthony himself. Regardless, it has long been clear that players run the show in the NBA, not coaches and executives. Settle down on Tebow, please! Whoa, slow down people! So far all Tebow has done in the NFL is lead one touchdown drive in a preseason game against a vanilla prevent defense played by third stringers, many of whom will probably be bagging groceries in two weeks and not playing in the NFL. He has done NOTHING to give even the slightest consideration that he can be an NFL starter. The fact is way too many people are praising Tebow’s performance Sunday night. I’ll admit he threw a beautiful pass to Matthew Willis that was dropped and he did show some guts on his touchdown run, but Tebow’s mechanics still need a lot of work. He still holds the ball too low when he starts his throwing motion. You think Dwight Freeney wouldn’t knock the ball right out of his hand? Even on Sunday night against third stringers, Tebow got bailed out by the tuck rule on what otherwise would have been a Bengals’ fumble return TD by virtue of Tebow’s poor throwing mechanics. He still has a lot to learn about reading NFL defenses, and if he keeps running like he did on Sunday night, someone like Ray Lewis is going to really bust him up. I’m saying this to bag on Tebow. He is just like any other rookie at the position. He has actually had a pretty good camp and seems way ahead of Brady Quinn for the backup spot. 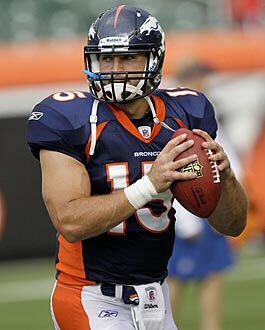 The fact is that Tebow is a project that will need time to transition to the NFL. I do like his intangibles in terms of locker room presence and leadership, and I do admire his toughness on the field and willingness to do anything to win, but physically he’s got a ways to go before he can be an NFL starter. This is not a Matt Ryan or Joe Flacco scenario where he is likely to come in and make that kind of impact right away. Those guys made impact as rookies, but were also much more equipped to make the transition to the NFL because they had the physical tools. Look folks, Kyle Orton is so far ahead in the race to be the Broncos starting quarterback this season that Tebow can’t even see his tail lights. Orton has had the best camp of any player on the team. He is throwing the ball with much more velocity and accuracy than he did last season, and all he did in his first preseason appearance was lead two touchdown drives against a playoff team from a year ago. Unlike Tebow, who played against many players who are not likely to make the Bengals’ final roster, Orton played against the first team unit. Oh, and Orton did this without any running game to help him because all of Denver’s running backs are injured. I feel like people are so blinded by Tebow mania that it has long gotten beyond ridiculous. He is a rookie. At that, he is a rookie that is a project. Kyle Orton is playing incredibly well, and I think he may in line for a Pro Bowl type season (yes you read that right: Pro Bowl). The only way that Tebow starts a game at quarterback for the Broncos at any point this season is if Orton gets injured, or the Broncos’ season has completely fallen off the wagon (say 3-7 or worse). The only way Josh McDaniels will even think about starting Tebow at quarterback this season is if this season becomes a lost cause and he is looking ahead to next season. I feel very strongly that this Tebow mania is very unfair to Orton and I feel like no one is acknowledging how well Orton has performed in this training camp. I will even take it a step further and say that anyone who thinks Tebow should be starter over Orton either doesn’t know much about how football is actually played or is highly delusional. Tim Tebow may blossom into a starter eventually, or he might not. Until he does, let’s say off and give him time and a chance to develop. For now, this is Orton’s team, and I think it should be really obvious that is best for the Broncos in 2010. Please, stop with the injuries! First of all, my sincere apologies for being a big delinquent and not posting anything for the past three months. 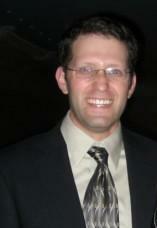 I have slapped a big penalty on myself and promise to post with a lot more regularity. It is not a coincidence that I am posting on the night of the first NFL preseason game this year between the Cowboys and Bengals. Honestly I happen to find preseason football completely useless, primarily because it is nothing more than chances for players to get injured. I am fearful of what this preseason is meaning for the Broncos, because they have already had a dozen players suffer injuries of varying severity during the first week of training camp, and we’re still a week away from the first of Denver’s meaningless four scrimmages. Of course I realize that players can get hurt at any time, I just get extremely frustrated when they occur during the preseason period during a time in which we’re a long way away from any kind of meaningful football. The biggest injury of course is that to Elvis Dumervil, who led the Broncos with 17 sacks last year. No one else on the team had more than four. You don’t have to be a football expert to see that this is a major blow to the Broncos’ defense. The Broncos know how important Dumervil is, for they signed him to a $58 million extension over five years just weeks ago. It appears in a best case scenario that the Broncos MIGHT see Dumervil in December, although it seems like the smart move would be let him have the season ending surgery to repair his torn pectoral muscle and make sure you don’t lose him for more than just this season. The Broncos will obviously miss his ability to rush the passer. What makes it worse is the guy they were counting on to replace Dumervil, Jarvis Moss, is out for a couple of weeks at least with a hand injury. The good news for the linebacking core is that Robert Ayers, last year’s first round pick who had no sacks, has dominated training camp and looks like he is showing great improvement over last season. While Dumervil is lost for the season, the Broncos are optimistic that most of the other injured players have a chance to ready for week one at Jacksonville. Knowshon Moreno (hamstring) and Correll Buckhalter (back/neck) both suffered injuries on the first day of training camp. This one day after the Broncos traded J.J. Arrington to the Eagles for special teams ace Joe Mays, a move that made sense at the time given Denver’s desire to upgrade the special teams unit, but made a lot less sense after the running core had been significantly depleted with the injuries. Denver signed LenDale White to add some depth in that area and give them someone who could run the ball during the preseason besides guys who are sure to get cut, and then White got hurt as well during his first day of practice with the Broncos. Worse for Denver is that White is facing a four game suspension from the league, so he won’t be available until October anyway. Then there are the injuries to the wide receivers. First round pick Demariyus Thomas, who was already dealing with a foot injury suffered before the draft, re-aggrivated the injury while making a spectacular touchdown catch in practice Saturday night. Third round pick Eric Decker also suffered a foot injury during a goal line drill in Saturday night’s practice. The good news is the Broncos don’t believe either of these injuries is serious. The Broncos did cancel their scheduled practice on Sunday, and I don’t think it’s a stretch to say it was partially because they were concerned other players might get injured. I do think it’s fair to say that most if not all of these injuries have been fluke in nature and they don’t appear to be the result of anything related to the team’s training or practice regimen. Of course there are other teams that have had the injury bug bite them during this preseason, but clearly there is no injury around the league that is near as significant as Dumervil’s. Factor in the other injuries the Broncos have suffered, and Denver has clearly been the most injury riddled team in the league so far in camp. It needs to stop, or else the Broncos’ season will be stopped dead in its tracks before it even has a chance to get rolling.